STAY INFORMED. GET INVOLVED. BE HEARD. 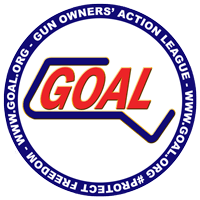 PROTECT YOUR FREEDOM, JOIN GOAL NOW! $30.00 a year, 8.2 cents a day will connect you to the greatest NRA Affiliated, State Association, and the only organization in Massachusetts, which will protect your Second Amendment Rights! Family memberships are only $5 more for the entire family. GOAL NEEDS YOUR SUPPORT JOIN HERE!